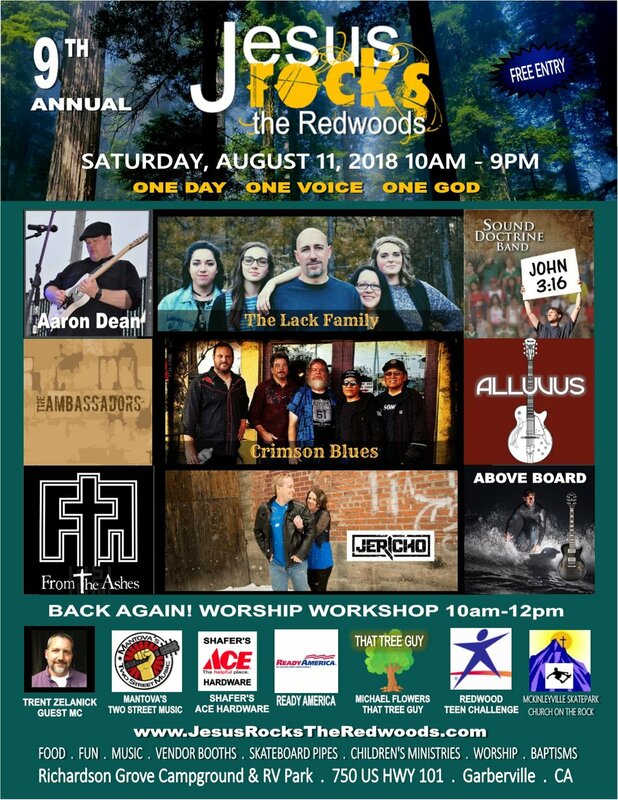 Jesus Rocks The Redwoods 2018 welcomes 3 NEW ARTISTS to our 9th Annual Festival. The Lack Family, Crimson Blues and From The Ashes will among our talented schedule of Christian musicians who come together for One Day, One Voice, One God. Bring the whole family for this amazing one-day event that will inspire you as we lift up the name above all names, Jesus! "On the twenty-third day of the seventh month he sent the people away to their tents, joyful and glad of heart for the good that the Lord had done for David, for Solomon, and for His people Israel..."
Isn't it amazing that this year's event falls on the same day that is referenced in scripture. "twenty-third day of the seventh month"! Our festival is located in a beautiful campground that is also referenced in this passage, "to their tents". God is truly incredible and majestic! 10 On the twenty-third day of the seventh month he sent the people away to their tents, joyful and glad of heart for the good that the Lord had done for David, for Solomon, and for His people Israel. 11 Thus Solomon finished the house of the Lord and the king’s house; and Solomon successfully accomplished all that came into his heart to make in the house of the Lord and in his own house. Please join us for this amazing day! Mark your calendars now. ~ Jesus Rocks The Redwoods!